Add moving water to your pond easily using the Beckett Pond and Waterfall Pump. Magnetic drive pumps are specifically designed to operate continuously with minimal energy consumption, handily creating fountains, waterfalls, or other aquatic ornamentation in your garden. These pumps are designed without seals, which can wear out, and have only one moving part, an impeller in a shaft. They also contain no oil, eliminating the danger of it leaking into your pond and harming your wildlife. This lasting design creates a low maintenance pump which uses less energy than a direct drive pump, and can potentially save hundreds of dollars over time. This large pump is ideal for powering a waterfall, moving water through a biological filter, or creating a fountain, and can circulate up to 1875 gallons of water in an hour. The unit is meant only for submersible use, and the two included foam prefilters protect the inner workings of the pump from debris. 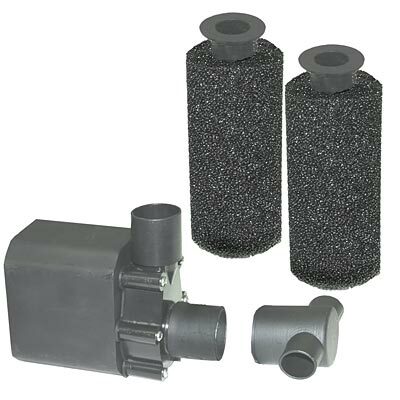 These foam filters both attach to the front of the pump via an included T-shaped fitting, and can be removed easily for cleaning, to maintain optimal performance. The all plastic pump body ensures a durable item, and the black color keeps it inconspicuous in your water. The top outlet accepts 1 1/2" flexible tubing with ease. Create a waterfall or fountain in your backyard pond using this Pond and Waterfall Pump. Two year limited warranty. Made in the USA.